Design of a Leopard on it, referring to Uri’s grown form. the plate [?] that holds the design of Kangaryuu resembles a champion belt which may refer to boxing? Design of Roll [the hedgehog, so cute] and spikes.. long spikes. the entire bracelet reminds me of handcuffs, Roll’s Cambio Forma. the ring on Tsuna’s middle finger reminds me of armor; possibly referring to Nuts’ Cambio Forma, a protective mantel. The mist ring’s new form could be shades or glasses? The rain ring’s new form could be a sword? Hopefully next chapter will reveal the others’ new version of the Vongola rings. Also, I’m starting miss Mukuro. … maybe.. just maybe, he might show up due to Chrome being taken away/kidnapped. Smoke would start appearing and Chrome will turn into Mukuro causing the Shimon family to be in shock and then… idontknow. Maybe Mukuro will ask– ‘What are you doing to my cute Chrome? Damn that Sawada for letting this creep [referring to Julie] kidnap my Chrome. Unforgivable~’. <– That’s a possibility. 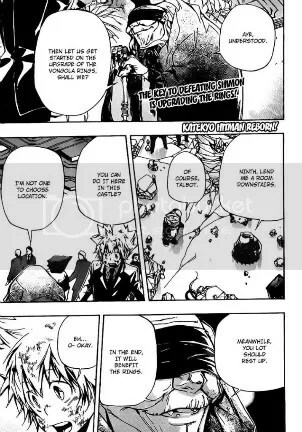 This entry was posted in Katekyo Hitman Reborn, Manga, Reading Right Now and tagged manga, Shimon Family, Vongola, Vongola Rings. Bookmark the permalink.